Join us for a night of magic, music and monsters at the WaGaliGong Halloween Show, this Saturday October 31st. 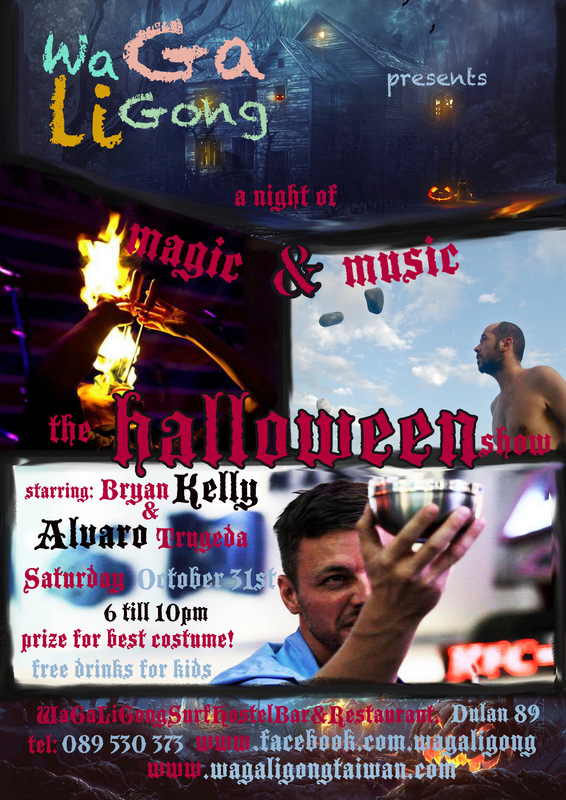 The show stars magician Bryan Kelly and musician Alvaro Trugeda, bringing us magic in different mediums. Witness the bizarre and dangerous magical world of Bryan Kelly. This live performance from a master showman will make you question reality. Watch as he walks on broken glass, swallows needles, and tastes fire. Alvaro Trugeda needs no introduction. The king of flamenco and master of guitar will make magic with his music. Alvaro is also a very talented artist and skilled mentalist, making hearts flutter and exorcising dead souls from blocked ears with his own magical instruments – his guitar and voice. Please dress up in your scariest costumes and bring your families and children. Free drinks for kids! A prize will be awarded to the monster with best costume.Where: WaGaLiGong, Dulan 89.When: Saturday October 31st Time: 6 till 10pm.Please join us later for the world cup rugby final between Australia and New Zealand at 11pm!